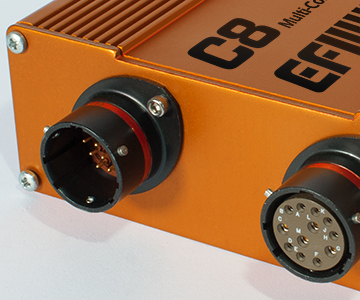 The Eight channel CDI is a compact eight output Capacitive Discharge Ignition system that is designed to be triggered by an ECU and drive up to eight external CDI coils. 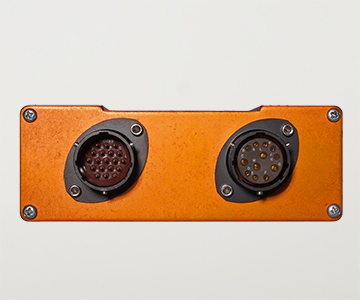 The enclosure is extruded 6061 aluminium that is environmentally sealed and features Autosport 12 and 19 pin main connectors. 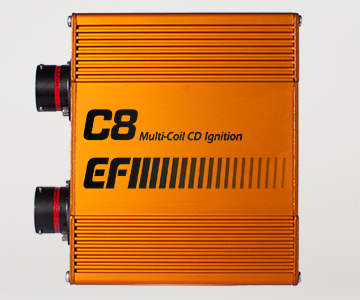 The C8 Multi-Channel CDI utilizes a proprietary high efficiency transformer and power stage design that allows full operation down to 10 volts. 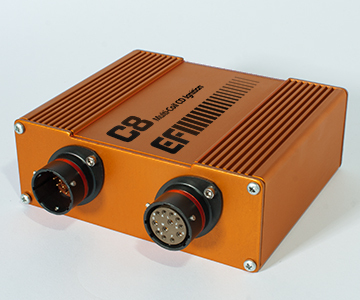 Its compact design features an integrated heatsink with Autosport connectors allowing for a small lightweight package with high output. Superior performance is achieved by reducing spark scatter, maximizing charge time and eliminating the voltage drop across the traditional cap and rotor. Dimensions: 4.90" x 4.80" x 1.40"